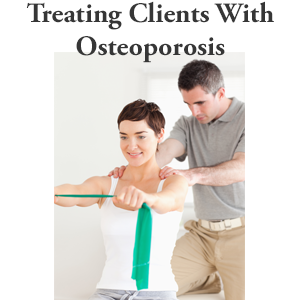 In this blog, I will cover four exercises for osteoporosis of the spine. 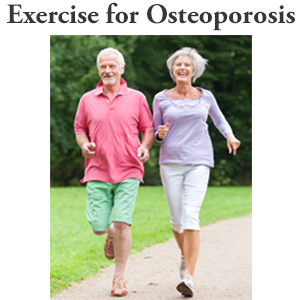 Three of the four exercises in the set have two variations (Athletic and Elite levels), so technically there are seven variations of these osteoporosis exercises for spine. 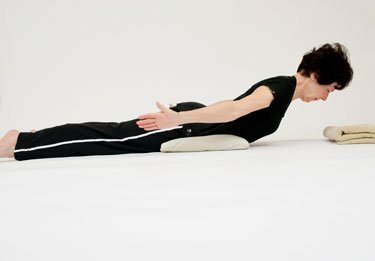 The Prone Exercise in M Position (also known as the Floor M) for Active Level is part of the Active strength exercises for osteoporosis of the spine in the Exercise for Better Bones program. It targets the neck extensors, spinal extensors, back, shoulders, and spine. The following are the instructions for Prone Exercise in M Position for Active Level — the first of four exercises for osteoporosis of the spine. With the Prone M Exercise, you’re going to need a pillow, and you’re going to need a little towel to place underneath your forehead. I suggest that you come forward, place that pillow right underneath your pelvis, and the towel right underneath your forehead. Before I go all the way down, I’ll say a little bit more or else it’s hard for you to hear me down there. Your arms are going to be down by your side, and your focus is going to be on lifting your torso with your head in alignment with your body the whole time, off the floor, okay? Come down, arms by the side. Take a nice breath in, and slowly, gently press the front of your pelvis into the pillow to help stabilize. You’re going to squeeze your shoulder blades together, open your shoulders, and by doing so, your palms turn away from you. Start lifting your chest and your head off the floor, so your neck is lifting off. I don’t want to see this motion, and I don’t want to see this motion. You’re head is always staying in a neutral position, and back down. When I say, “Neutral position” for your head, if ever you were in the middle of an exercise and someone came up to you, imagine a big giant coming up to you and just flipping you on your feet, you would still be in a position where your head was just looking straight ahead, you would just be standing, looking straight ahead. You don’t want to be in a position where you’re standing and looking up to the ceiling or standing and looking down. We’re going to review the Floor M one more time from the start. Slowly, gently press the front of your pelvis into the pillow. Squeeze the shoulder blades down and back towards your back pocket. You’re going to lift your torso off, your legs should not lift off. Eyes are just looking straight at the towel. If you could imagine holding a little clementine, you would be holding that under your chin, and back down. As with all the other exercises, I have a 1 to 2 second hold for this exercise, but if you are able to hold longer, 5 and 10 second holds are great with this exercise, as it really builds the endurance of your back muscles. And that’s it for the Prone Exercise in M Position for Active Level. Muscles: Neck Extensors, Spinal Extensors, Back, and Shoulders. Lie face down with a pillow under your pelvis and rolled towel under your forehead. Arms rest at your side. Simultaneously, raise your head, chest and arms off the floor drawing your shoulder blades downward and together. Rotate your arms to open up your chest. Turn your palms away from you with your thumbs pointed towards the ceiling. Return to starting position and repeat until set is completed. Do not lift your chin away from your chest as you lift. Imagine holding an orange under your chin. In this video I demonstrate three Athletic level exercises for osteoporosis of the spine from the Exercise for Better Bones: Ball T, M and Y exercises. The following are the instructions for Ball Exercise for Athletic Level — the second of four exercises for osteoporosis of the spine. When you’re first starting off with these letters it is advisable to have a firm surface to press against for your feet. The wall works well, otherwise, I’ve set up my bench with a stack of weights on it. Another choice would be up against your sofa. Anything that is firm that you can press against works very nicely. You want to, as much as possible, get your foot in contact with the floor and the wall, or the floor and the surface, meet together. A lot of my clients in their 50s and 60s have arthritis of their big toe and they find this position of their foot very challenging, and so you might choose, then, to put your running shoes on if that’s the case. You want to kneel tall behind the ball. You’re going to mount the ball. You have a choice of either lifting yourself onto the ball like this, or if you don’t have the strongest triceps yet, you can place one hand in front of you like this, take the other hand, and slip the ball underneath your pelvis. Ideally, in your start position, your knees will be just off the floor. This is the start position. Your back is flat, your feet are hip-width apart, so that you still feel balanced and stable as you press forward. When you’re first starting this, you might want to just focus on getting the extension of the knees, straightening the knees and straightening your torso, come back down. Again, the direction of your trunk is as though you’re being lengthened towards the opposite wall and ceiling where they meet across the room. The objective is not to hyper-extend your back and go way up to the ceiling. Again, it’s more of a lengthening. Your head, as with most things, your head is always in a position where if I walked into your living room and flipped you up on your feet, your eyes would just be straight ahead. You’d be always in this nice alignment because that’s where you want to be strong in, is in your best postural alignment. Let’s go through the M.
Get onto the ball, breath in, and exhale coming into an M position. My arms are creating that M. I’m turning outward. I don’t want my arms in because that’s going to close me up in through the chest, so you’re looking for an outward position, and back down. With that, remember to squeeze the shoulder blades, one, two. This is a nice one if you have the time and want to spend a longer hold. 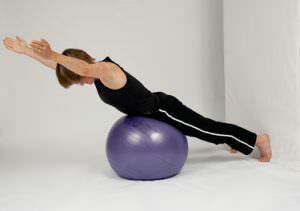 It’s great because your spinal extensions are back endurance muscles, so you can go for a 4-, 5-, 10-second hold. Into the letter T, arms are in front and they’re coming straight out so that when you look sideways, you don’t lock your elbows. The focus is on your back muscles, so the shoulder blades being pulled together. Your hands will end up being at the height of your ears, so if you look to the side, you’ll see your hands to the height of your ears, and back down. Let’s do the T one more time. Breath in, exhale coming out into the letter T.
Focus on lifting, lifting, lifting, lifting the whole time, and back. When you lift your arms, the exercise is just starting. You don’t want to just hold them there, you want to imagine that you have magnets in your ceiling that would draw in your arms up towards the ceiling the entire time, and I’m going to demonstrate that with the letter Y. With the letter Y, we’re down, we come forward. I could take that exercise and it would be relatively light with the arms being held like this, but I want to keep driving those arms, up, up, up, up, up towards the ceiling, and back down. One more time on the Y, breath in, and up, up, up, up, up, up, up the whole time as you’re driving and holding that nice lengthening position, and back down. And that’s the ball levers. 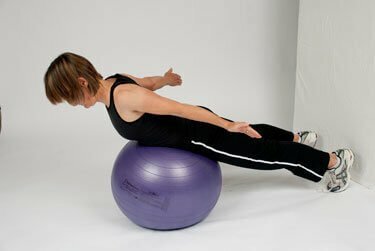 The Ball T is a strength exercises for osteoporosis of the spine from the Exercise for Better Bones program specifically designed for the Elite Level. The exercise targets the muscles of the neck extensor, back, shoulders, and buttocks. It also targets the bones in the spine. The following are the instructions for Ball Exercise for Elite Level — the third of four exercises for osteoporosis of the spine. At the elite level you don’t use the support for your feet. You require more core stability and strength through not only plantar flexors, but your whole core extensors because you’re getting that extension without the help of the wall. As in the athletic level, I mentioned that a lot of people do get arthritis in the great toe in their 50s and 60s. Performing a push off with bare feet might be quite uncomfortable, at which point, as the model demonstrated in the photographs, you can use running shoe. It is helpful if you have a wood surface or a linoleum surface, whereas if you’re barefooted, you want to make sure you’re off of a yoga mat because you want to have enough grip from your toes. We’re going to start with kneeling straight behind the ball. Mount the ball, so you’re going to lift yourself onto the ball. Ensure that your toes are placed so that you get that nice push off. Have even weight bearing, if possible, through all your toes. You don’t want to be more on your big toe only or your little toes, so that tells you that your rotation in your lower body is in its neutral position. We’re going start with the letter M.
You’re flat over the ball, arms are in front of you, you take your breath in, and you’re going to push forward into an M, lifting up. Now, as you come into your M, ensure that you’re externally rotating so you’re opening up through the shoulders, squeezing the shoulder blades together. Focus is not on hyperextending, but rather getting that healthy extension with elongation, so as though I’m being drawn across the room. We do the same thing with the T, except I’m going to come up into a 90-degree position in the arms, my hands are at the height of my ears. Again, lengthening, keeping a nice neutral neck so not coming up or squeezing down. And one more with the Y. With the Y, you bring your arms into a Y position and drive them up. The entire time as with the Ms and the Ts, the exercise doesn’t end with the lifting of the arms, you want to be driving your arms up, up, up, as though you had magnets in the ceiling drawing your arms up past your ears the entire time, so that you’re getting good work in the lower traps as well as your, all of your back muscles were involved in that exercise. Because your postural muscles are endurance muscles, if you would like to do this one with a longer hold, you certainly can. I’m going to now demonstrate it holding small weights as well. 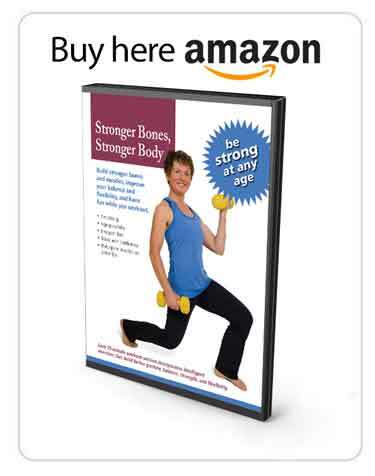 Here is an additional exercises for osteoporosis of the spine, the spinal stretch. Tried floor M. I was not able to lift even an inch. Are there any exercises that will build up the strength enough to be able to start doing this exercise. Also, practicing sitting nd standing tall throughout the day will also reinforce the strength and endurance of your postural muscles. Even though you cannot lift off yet I encourage you to persevere. You can only get stronger by doing so! Great advice and great exercises.